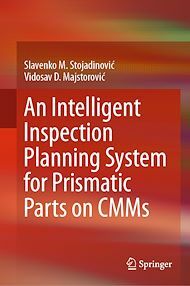 This book examines an intelligent system for the inspection planning of prismatic parts on coordinate measuring machines (CMMs). The content focuses on four main elements: the engineering ontology, the model of inspection planning for prismatic parts on CMMs, the optimisation model of the measuring path based on an ant-colony approach, and the model of probe configuration and setup planning based on a genetic algorithm. The model of inspection planning for CMMs developed here addresses inspection feature construction, the sampling strategy, probe accessibility analysis, automated collision-free operation, and probe path planning. The proposed model offers a novel approach to intelligent inspection, while also minimizing human involvement (and thus the risk of human error) through intelligent planning of the probe configuration and part setup. The advantages of this approach include: reduced preparation times due to the automatic generation of a measuring protocol; potential optimisation of the measuring probe path, i.e., less time needed for the actual measurement; and increased planning process autonomy through minimal human involvement in the setup analysis and probe configuration.